The first reference to a Department Band was mentioned in August of 1933 when it was stated that band equipment was purchased, but little other information is stated in the minutes. However photos from this period indicate that a Department Band functioned until April of 1934 when it was approved to donate the ‘Drum Corps’ equipment to the ‘Hauppauge Orphan Home’ with the stipulation that they provide music for the Department at parades a total of six times. Then in May of this same year, a ‘Drum & Bugle Corps’ was re-organized with Joseph Carmody as Instructor. John Mueller, Jr., Marcus Conklin, A. Koch, Thomas Shanley, Joseph Carmody, W.S. Cox, Carl Gruen, Peter Doelger and Ed Maguire joined as bugle players, with drum players consisting of J. McMahon, Charles Lawlor, Alfred Wolf, Joseph Erdman, Louis Strick, Al Giza and Jack Schneider. This group was apparently short lived as a discussion was held on February 7, 1938 to form another ‘Drum & Bugle Corps’. Both Bill Schork and Lloyd Rhoda served on the Committee to reform this unit – practice sessions were supervised by the High School Band Instructor and sessions were held twice per week. Then in June of 1941 it was agreed to send $25.00 to the Central Islip State Hospital Band for services rendered at the Islip Town VFA Parade held in Islip Terrace. Although not specifically mentioned, this signaled the end of the ‘Drum & Bugle Corps. A ‘Juvenile Fire Department’ was organized in 1945 which provided marching music for the Department until the mid-1950’s. The State Hospital Band was then used through the balance of the 1950’s and 1960’s until cut-backs by the State of New York in 1968 made this Band unavailable. A motion to create a new Department Band was defeated at the Department Meeting held in July of 1969. The formation of the ‘Firebelles’ Band in 1973 provided music for Department parades until 1997. Reference was made to forming a new Department Band at the March 1998 Meeting. Chief Robert A. Miller requested the names of all members interested in joining the Band at the October 5, 1998 Meeting. The new Department Band made it’s first appearance at the Memorial Day Parade in 1999 with the following members – Phil Goglas – Bandmaster, Robert A. Miller, James P. Miller, Jim Sodergren, Christopher Murphy, Patrick Murphy, Charles A. Murphy, Daniel Ehrhardt, Jr., David Ehrhardt, Darren Ehrhardt, Michael Bartley, Jennifer Saas, Robert Kuehn, Sean Sweeney, Scott Gershowitz and Phil Falco. The Band was also requested to perform at the official opening of the new Federal Court House on October 16, 2000. 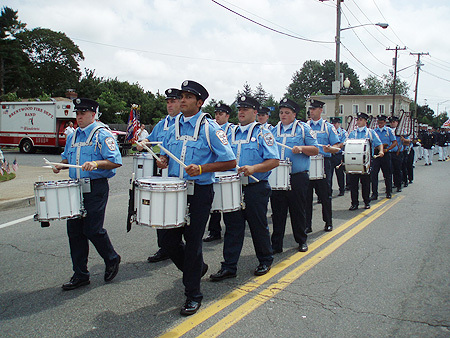 The first parade prize won by the new Band was at the Southern New York Parade at North Merrick on June 9, 2001. They finished third at the Islip Town Parade at Islip on August 12, 2006, and captured their first New York State Parade prize for 3rd Place Best Appearing Continental F.D. Band at the Parade held in Utica (Deerfield) on August 19 of the same year. Since 2006 the band has paraded in numerous parades for the Central Islip Fire Department, as well as other Departments in Suffolk County and for the Spencerport Fire Department.